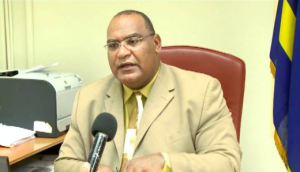 WILLEMSTAD – During the raid at the house of the former Minister of Traffic, Transport and Spatial Planning, Charles Cooper, authorities found 50,000 guilders in cash. This money was seized. This is according to the spokesperson for the Public Prosecution, Norman Serphos. Cooper’s wife is now suspected of money laundering. She herself and her husband declared, after the incident, that the money comes from her medical practice. They say they have invoices to prove it.